This is the combination that is in my 2002 Silverado Shop Truck. Its the next step beyond the Z06 cam and has the old school lopey cam sound and like an 800-850 RPM Idle - Click on link to listen! > This is what most guys will want in a street vehicle, but its not too crazy for an offroad car either. A higher stall converter is recommended for the street. I run a 3600 stall Yank converter and LOVE it on the street. I would recommend 1800-2000 stall for an offroad application to keep trans temps down and minimize tire spin when crawling. This will start to push the limits of a 4L60e transmission and internal upgrades are recommended. This is really the limits of a "street'able" cam in a Vortec Truck engine IMO. The stock heads, intake manifold, and 78mm throttle body just won't flow enough air to make much more HP natural aspirated. There are bigger cams but they get really temperamental on the street and are made for pure drag racing. This Trick Flow cam can be driven daily, handles idling moderately well with A/C, electric fans, etc. To get to 500HP requires changing the heads, intake manifold, throttle body, & injectors. The price tag on this almost doubles the turnkey price. So you can make around 400HP for $4k, but it will cost you almost $8k to make a legit 500+ "street'able" HP natural aspirated. Note: This is getting into the "extreme" range of cams. With several variables of all projects, i.e. 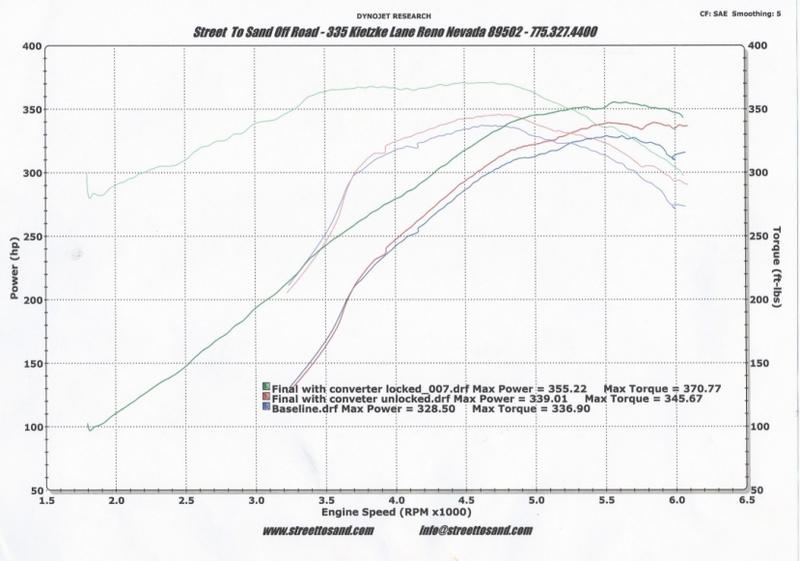 torque converter stall speeds, transmission upgrades, electric fans, A/C, ring / pinion ratios, etc. some fine tuning may be necessary, particularly with the idle. Here is the chassis dyno sheet from the Shop Truck with this combination of parts. 355HP & 370TQ to the ground. This was my first time EVERY drag racing. Had lots of fun and learned a lot - Like when you make enough HP getting it to the ground without smoking street tires is difficult. The step-side truck has little rear weight. I was completely letting off 2-3 times off the line to stop the tires from spinning. I think with the right tire its a 13.5s truck. This was at Top Gun Raceway, Fallon, NV. 4000ft elevation.